Fall is the air and it's time for my family to enjoy some of our favorite autumn dishes. Apples, pumpkins and squash are all plentiful during this time of the year. 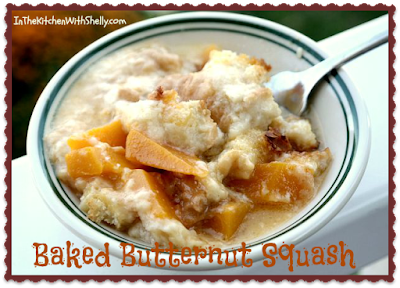 Just last week I whipped up our favorite squash recipe and within one day...the family had devoured it. This recipe only requires a handful of ingredients and is very easy to prepare. The recipe will make 4 servings and you can easily double the ingredients for a larger sized family. Note: I use whatever shredded cheese I have on hand. Most of the time it's a combination of Mozzarella and Cheddar Cheese. In a large bowl toss together the cubed butternut squash, melted Country Crock Spread, chopped onions, shredded cheese, milk and cream. Pour mixture into a glass baking dish (I use a 3 quart casserole dish but you could use a 2 quart one). Place cubed bread on top along with the salt and ground black pepper. Place baking dish into a preheated 350 degree oven and bake for 50 to 60 minutes or until done. Remove and let stand for 5 minutes before serving.